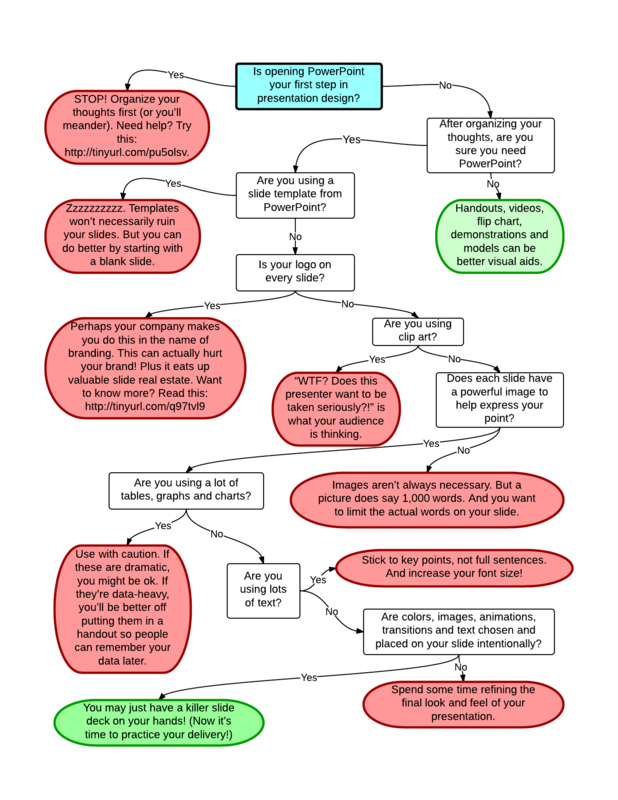 Flowchart: Is Your PowerPoint Any Good? Want to deliver a killer presentation? You’re going to need top notch slides to accompany your delivery. Have you put together a deck of top notch slides? I’ve put together a little flowchart (click here to download a pdf version) to help you check your work. Is there anything missing from the flowchart? Let me know in the comments section below. Know of someone else who’s in need of killer PowerPoint design skills? Pass this along! As for you, if you want access to a steady stream of articles to help improve your presentation skills, be sure to click “Follow”! GREAT visual process for this, Brian!! Thanks!! Thanks Peter! Sometimes visuals are so much more powerful than paragraphs and paragraphs of text.